Russia has never transferred any stealth technology to China to assist it with its J-20 Black Eagle fifth-generation stealth fighter prototype, Russian plane maker MiG said. "We are not delivering any equipment to China, and never have," MiG spokeswoman Yelena Fyodorova said. MiG's statement follows claims in the Russian and foreign press last week that China's J-20, unveiled over six months ago, is based on technology and components from the Russian Mikoyan Article 1.44, a stealth technology demonstrator aircraft, development of which was suspended. Some analysts say the aircraft have close similarities. "The back end of the J-20 looks awfully like the 1.44, as does the overall layout with delta canards," said Douglas Barrie, an air warfare specialist at the London-based International Institute of Strategic Studies. "If it's a coincidence, it's a striking one. Russia may have provided technical support, but there is nothing substantial to prove that. China has however relied on Russia for much of its defense procurement for a decade and a half," he added. 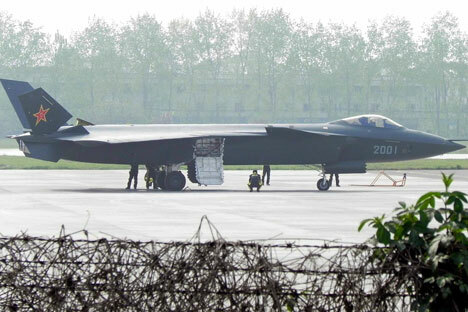 China's J-20 Black Eagle is thought to be conceptually similar to the U.S. F-22 Raptor and the Russian T-50 jets, but is likely to be just a technology demonstrator or prototype rather than a viable fighter. China has been working on a future fighter program since the mid-1990s, but the J-20 is not expected to enter service before 2018-2020. Earlier in the month, Mikhail Pogosyan, the head of Russia's United Aircraft Corporation said that China's fifth-generation fighter program is more for effect than substance and branded the maiden flight as a "show-off." China relied on the Soviet Union for much of its aviation technology until the Sino-Soviet split after 1961. China then carried on developing copies of Soviet and Russian aircraft. Beijing also relies on Russian engines, radars and electronic components for many of its other aircraft, such as the JF-17 fighter it developed jointly with Pakistan.